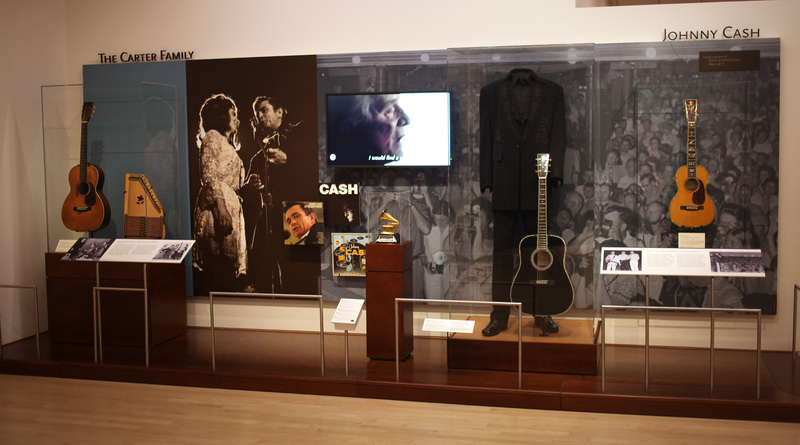 The Musical Instrument Museum (MIM) in Phoenix recently unveiled an exhibit honoring the Carter Family and Johnny Cash. Located in MIM’s Artist Gallery, the exhibit provides guests with an overview of the musical careers of the artists and their historical impact. Items on display in the Carter Family and Johnny Cash exhibits have never before been displayed for the public and come to MIM on loan from John Carter Cash, son of Johnny Cash and June Carter Cash, and Dale Jett, grandson of A.P. Carter. The items will be on display through April 2016. The music of the Carters (A.P., Sara and Maybelle Carter) has been celebrated for nearly a century. The trio, which recorded more than 250 songs, is widely recognized for helping launch country music’s commercial beginnings and for inspiring many artists in later genres including bluegrass and rock. The exhibits also feature photographs from the Grand Ole Opry Archives and performance footage from several sources. The Carter Family and Johnny Cash exhibits join the ranks of other country music-focused exhibits at MIM. MIM’s Artist Galley features instruments played by Elvis Presley, Roy Orbison, and the Nitty Gritty Dirt Band. In MIM’s United States/Canada Gallery, the Country exhibit displays items belonging to Marty Robbins, Buck Owens, Kix Brooks and others. Entrance to MIM’s Artist Gallery is included with general museum admission.